The hard-fighting brigade of Kentucky Confederates etched a remarkable chapter in Civil War history as the ultimate example of divided loyalties. On April 15, 1861, three days after the bombardment of Fort Sumter, President Abraham Lincoln issued a call for 75,000 volunteer troops. Their purpose was to augment the Federal Army that would put down the burgeoning rebellion and save the Union. Pro-Southern Governor Beriah Magoffin’s response was terse and to the point. “I will send not a man nor a dollar for the wicked purpose of subduing my sister Southern states,” he said. Although Magoffin was forceful in his reply, the governor apparently did not speak for the majority of his own people. For years, partisan rhetoric and posturing had wracked the Commonwealth of Kentucky, and by the spring of 1861, when both Unionists and Southern sympathizers were in the midst of raising and training their own state militias, nearly 20 percent of the population was slaves. Despite their personal loyalties, Magoffin and other prominent Kentuckians sought to avert secession, maintain the Commonwealth’s neutrality, and possibly play a role as a mediator in the conflict. The story of the Confederate 1st Kentucky Brigade is indicative of the tragedy spawned by divided loyalties among the citizens of a state. The largest formation of Kentucky soldiers raised by either North or South during the Civil War, the 1st Kentucky has become known to history as the Orphan Brigade. These men left their homes and families to serve the Confederacy, and when the state remained in the Union, they were essentially cut off from the lives they previously had known. As long as the Confederacy survived, they could not, in a very real sense, go home again. In response to growing concerns in the wake of terrorist John Brown’s 1859 raid on the Federal arsenal at Harpers Ferry, Virginia, Governor Magoffin and the Kentucky legislature approved a restructuring of the state militia in the spring of 1860. Known as the State Guard, the small army was organized and trained under Simon Bolivar Buckner, an 1844 graduate of the U.S. Military Academy at West Point and a veteran of the Mexican War. Elections in the summer of 1861 resulted in Kentucky Unionists winning nine of 10 seats in the U.S. Congress, along with control of the state house and senate. Magoffin was substantially weakened politically, and funding for the State Guard dried up as most lawmakers believed erroneously that the militia was staunchly pro-Confederate. (Buckner actually favored neutrality.) Another militia, this one dubbed the Home Guard, was authorized to counter the State Guard. Recruiting was feverish, and at times passions ran so high that it appeared fighting could erupt at any moment. “Blue coats and gray coats rubbed against each other in public places with a smothered energy that told too plainly the conviction of the wearers of each that the others would furnish a most desirable and beautiful target for practice at musket range,” wrote one observer. The neutrality declaration forbade either side from recruiting actively within the state, but clandestine efforts continued. Amid the rising tide of Unionism, it soon became apparent that organized forces with Confederate sympathies would not be welcome in Kentucky. In September, all Confederate troops were ordered to leave the Commonwealth, and the state legislature ended formal neutrality. Kentucky would remain in the Union. During the course of the war, 60 Kentucky infantry regiments would serve with the Union armies and nine with the Confederate. In early July, while the first major battle of the Civil War was unfolding at Manassas, Virginia, Kentucky Confederates established a pair of training sites, christened Camps Boone and Burnett, across the state line in Montgomery County, Tennessee, a few miles from the city of Clarksville. Hundreds of volunteers arrived and were organized into the 2nd and 3rd Kentucky Infantry Regiments. Two months later, the 4th Kentucky was organized. Even as the Kentucky Confederates were legislated out of their home state, President Lincoln, sensing that he had the upper hand in the Bluegrass State, refused to honor Magoffin’s request that a Union recruiting post be moved from Kentucky to Ohio. Almost simultaneously, the Confederate Army launched an invasion of Kentucky. On orders from Maj. Gen. Leonidas Polk, then the commander of Confederate forces at Memphis, Tennessee, Brig. Gen. Gideon Pillow marched into Columbus, Kentucky, on the Mississippi River. Federal forces under Brig. Gen. Ulysses S. Grant then moved into Paducah, near the confluence of the Tennessee and Ohio Rivers. Meanwhile, on the day that Kentucky declared its solidarity with the Union, Buckner ordered his three infantry regiments to board trains for Bowling Green, an important rail center. 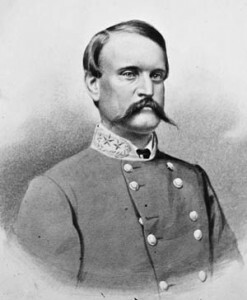 Buckner had declined a brigadier general’s commission in the Union Army and accepted an appointment from General Albert Sidney Johnston, commander of Confederate armies in the West, as a brigadier. An artillery battery of brand-new bronze, six-pounder guns was placed aboard flat cars for the rail trek to Bowling Green. Kentucky-born Edward Byrne had paid with personal funds for the battery’s guns, horses and equipment. Young men intent on fighting for the Confederacy kept arriving in Bowling Green, as many as 900 in two days. Organizing and equipping the new recruits was a significant challenge, but by the end of November a full brigade had been assembled. In addition to those units constituted at Camps Boone and Burnett, the 6th and 9th Infantry Regiments came together at Bowling Green, as did an artillery battery under Major Rice E. Graves and the 1st Kentucky Battery under Captain Hylan B. Lyon. The formation of the 1st Kentucky Cavalry was authorized in October 1861, and command was given to 30-year-old Colonel Benjamin Hardin Helm, Abraham Lincoln’s brother-in-law. Private Thomas McCreary fought with the 3rd Kentucky Cavalry, part of the Orphan Brigade. The 9th Infantry Regiment had originally been constituted as the 5th Infantry, but another unit in eastern Kentucky had already organized with that designation, and in October the regiment became the 9th Infantry instead. Another formation of note was the Lexington Rifles, commanded by Captain John Hunt Morgan, a young cavalryman destined to become the stuff of legend. On October 28, Johnston formally combined the assembled units into the 1st Kentucky Brigade, whose command he gave to Maj. Gen. John C. Breckinridge, who a few months earlier had been the sitting vice president of the United States in the administration of James Buchanan. Breckinridge, the most prominent Kentuckian of his time, had sought to avoid secession and favored neutrality for Kentucky, but also interpreted the Constitution as favoring state sovereignty. Breckinridge had finished second to Lincoln in the presidential election of 1860. 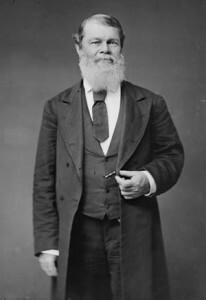 Kentucky Unionists falsely branded him a secessionist and tried to have him arrested, fearing that his mere presence would interfere with their efforts to suppress Confederate influence in the state. During the winter of 1861-1862, the 1st Kentucky Brigade numbered roughly 3,800 men. Days of drill, camp life, and homesickness were made more difficult by a measles epidemic that kept many men sick. Hundreds lay feverish, and many died. The weather was harsh, and extended marches to meet phantom foes left nothing but tired, footsore men who discarded much of their equipment along the muddy roads back to camp. Maj. Gen. John C. Breckinridge, served as vice president of the United States under James Buchanan. The first battle casualties among the Orphans occurred in early December. Two men of the 5th Kentucky were killed and one wounded when a detachment of 13 guarding a railroad bridge were set upon by 90 Union men of the Home Guard. The rest of the Confederates were taken prisoner. In February 1862, the pace of war quickened as the 2nd Kentucky Infantry, under Colonel Roger Hanson, along with Graves’ Battery and a company of the 4th Kentucky, were detached for service at Fort Donelson on the Cumberland River in Tennessee. While some Confederates, including the cavalry commanded by fearsome legend-in-the-making Nathan Bedford Forrest, slipped through the Union siege lines under cover of darkness, Buckner cataclysmically surrendered more than 12,000 troops. During the brief fighting at Fort Donelson, the detached Orphans lost 13 killed and 62 wounded. The rest headed to Northern prison camps. Following the fall of Fort Donelson, it became apparent to Johnston that his defensive line in Kentucky could not be held successfully. Breckinridge’s men regretfully turned their backs on their home state and marched south to Murfreesboro, Tennessee, where the brigade was augmented with the arrival of two battalions of infantry and a company of cavalry from Alabama and a single battalion of Tennessee infantry. By early March, the 1st Kentucky Brigade had fallen back another 100 miles to Decatur, Alabama. A few days later the Kentuckians boarded trains for Corinth, Mississippi, where Johnston was gathering his scattered forces and planning an offensive against the relentless Grant, who had moved deep into western Tennessee and was thought to be in the vicinity of Pittsburg Landing, a few miles across the state line from Corinth. Johnston reorganized his command structure as a major engagement loomed. His Army of Mississippi included three corps led by Maj. Gens. Braxton Bragg, Leonidas Polk, and William Hardee, with Breckinridge taking command of the reserve corps when its initial commander was cashiered for drunkenness. With Breckinridge elevated to corps command, Colonel Robert P. Trabue of the 4th Kentucky took over lead of the brigade. A 38-year-old lawyer who had gone to war in Mexico as a volunteer private and returned with the rank of captain, Trabue had settled in Mississippi, but as war clouds gathered, he came home to marshal his own regiment, which became the 4th Kentucky. On Sunday morning, April 6, Johnston’s Confederates attacked Grant’s forces, achieving near total surprise. About 2:30 pm, while directing troops, Johnston was struck by a bullet behind the left knee and bled to death in half an hour. Overall command devolved to General P.G.T. Beauregard. The fighting was intense throughout the day, and the Federals clung to a salient in their center that came to be known as the Hornet’s Nest, slowing the increasingly sluggish Confederate advance. With Trabue having been in command for only a few days, the Orphan Brigade descended into the maelstrom at Shiloh. The 3rd and 4th Kentucky deployed forward, and Trabue maintained contact with Polk’s left flank. At about 9:30 am, just as he came upon a substantial concentration of Union troops threatening to fall upon the unsuspecting Polk, Trabue was stripped of the 3rd Kentucky, 4th Alabama, and several other units and ordered by Bragg to move to the right. 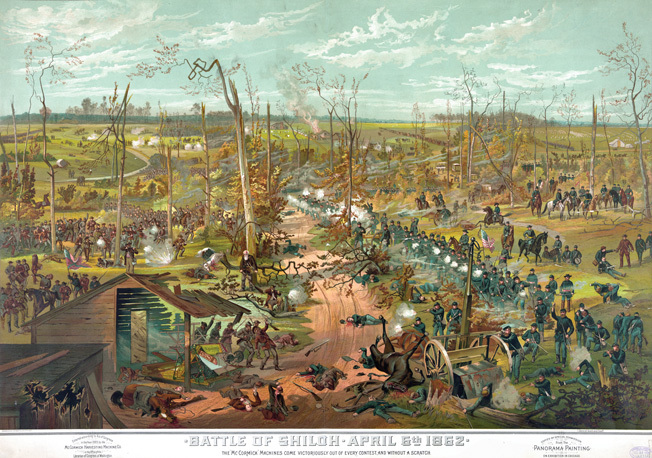 At Shiloh, the Orphans assaulted Union troops at the Hornet’s Nest on the first day of fighting, then fought fellow Kentuckians under Union Generals William Nelson and Thomas Crittenden. Trabue believed his command to be greatly outnumbered but coolly directed three of his regiments as the fighting grew in intensity. Eventually, he committed his reserve, the 31st Alabama, and picked up other troops to his rear. The 4th Kentucky and the 46th Ohio closed to within 50 yards of each other and blazed away. The order to fix bayonets was passed along the Confederate line, and Trabue led the ensuing attack. The Union regiment broke and ran. The Orphans surged forward, overrunning Union campsites and capturing a silk flag emblazoned with the goddess of liberty and the mottos, “We will die for our country” and “Victory or death.” Since both the camp and the flag had been abandoned and the Union troops to which they belonged were nowhere in the vicinity, the incident provided some fleeting amusement for the Confederates. Virtually everywhere, it appeared, the enemy was in retreat. The lone exception was the Hornet’s Nest, the sunken road where troops under Brig. Gen. Benjamin Prentiss refused to budge. For seven hours the Confederates hurled themselves against Prentiss’s rock. As Trabue’s front cleared, he wheeled to the right. His soldiers leveled their rifles and delivered several volleys into the ranks of Union troops attempting to slip away from the Hornet’s Nest. The Orphans slammed the door shut as other Confederate units closed in, compelling Prentiss and more than 2,200 enemy troops to raise the white flag. Amid the carnage of the Hornet’s Nest, Trabue saw Breckinridge for the first time since early morning when the reserve corps commander had been called to another part of the field with two brigades. With daylight fading, Breckinridge prepared for a final assault to drive Grant into the Tennessee River, but Beauregard ordered an end to the fighting before the attack could be launched. On the night of April 6, most of the Orphans camped on ground they had taken from the 46th Ohio earlier in the day. They gorged on cheese, coffee, tea, and fruit that had been abandoned by the Union soldiers. Sleep was fitful for many, and the cries of the wounded lying unattended on the battlefield could be heard. When morning came, Trabue assembled his command, and while Byrne’s Battery dueled enemy artillery, the Kentuckians stood their ground against several charges. The din of battle increased toward the center and right of the Confederate line as Union counterattacks increased. Turning to meet this new threat, the Orphans became hotly engaged, and for the next half hour the opposing lines ebbed and flowed. 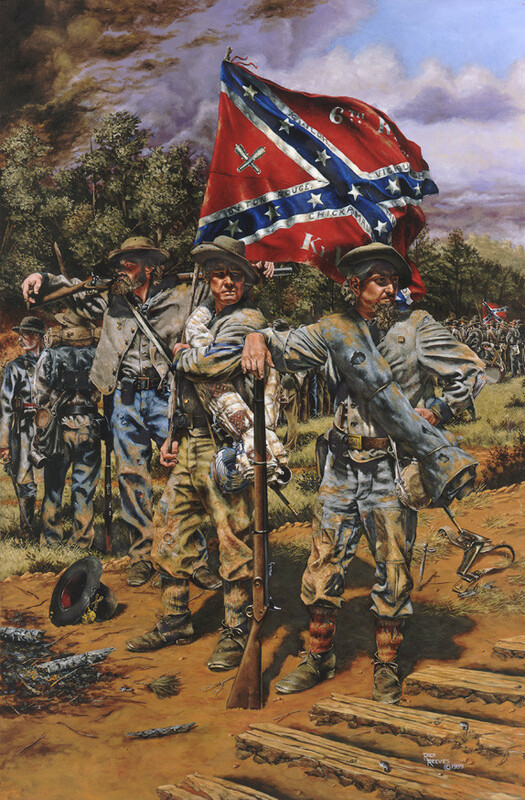 Artist Rick Reeves’ painting, The Orphans, shows members of the 6th Kentucky Regiment during the 1864 Atlanta campaign. By then, the brigade had been in action for more than two years. As the day wore on, Union reinforcements continued to arrive on the field, and sometime after 2 pm Beauregard ordered a general withdrawal. Trabue pulled his command back from its positions near the Shiloh Church, and Breckinridge and the reserve corps served as the rear guard, covering the Confederate retirement. At nightfall on April 7, the Orphans camped less than two miles from the battlefield. The next day, they continued to cover Beauregard’s retreat and moved three more miles south toward Corinth. On April 10, the Orphans were safe in Mississippi. They had shown tremendous courage at Shiloh, but the cost was high. The 4th Infantry had lost more than half its number. More than one-third of the brigade’s strength, nearly 850 of 2,400 men, were killed or wounded. Several senior officers were dead or injured. The Orphans had endured the great and costly battle, but more stern tests were still to come. The respite at Corinth was temporary, and within weeks Beauregard had retreated south to Tupelo. In the meantime, without explanation, he divided the Orphans into two brigades. Breckinridge protested to no avail, and the rank and file grumbled. At the end of June, the Orphans were serving garrison duty in Vicksburg, experiencing shelling from Federal gunboats on the Mississippi River. In July, Maj. Gen. Earl Van Dorn ordered Breckinridge’s command, now designated a division, to capture the Union garrison at Baton Rouge. It was an ill-advised adventure, and during the march through Jackson Breckinridge lost 600 men to disease or desertion. The Orphans stood tall among the Confederates assaulting Baton Rouge. During fighting on August 5, they lost more than 100 killed or wounded. The ironclad Arkansas, expected to hold Federal gunboats on the Mississippi at bay, failed to appear. There was no alternative but to withdraw northwest to Port Hudson. Breckinridge was commended for his performance. The Orphans’ participation in Maj. Gen. Earl Van Dorn’s ill-conceived Baton Rouge expedition in July 1862 cost the brigade another 600 men to disease or desertion. There was talk of joining Bragg for an offensive into Kentucky. Van Dorn declined to release Breckinridge’s division, however, and valuable time was wasted in political wrangling. By the time Breckinridge’s command reached Knoxville, Tennessee, via a circuitous route by foot, steamer, and rail, more precious time had elapsed. Bragg had been defeated at Perryville, Kentucky, and retreated, blaming Breckinridge’s late arrival for the failure of his offensive. Along the way, Breckinridge not only had to contend with transportation difficulties and political infighting, but also with a mutiny of sorts among some of the Orphans whose one-year enlistments were up. The contentious Bragg rubbed salt in the wound, and his enmity for the Kentuckians would soon cost them dearly. Disappointed that their ambitions to return to Kentucky soil were once again thwarted, the men of the Orphan Brigade joined Bragg’s retreating army at Murfreesboro. The lone bit of good news during the late summer was the return of Colonel Hanson and the bulk of the 2nd Kentucky, released through a prisoner exchange program after more than six months in Northern prisons. General Buckner was also exchanged and had already moved to join Bragg. By late October, Breckinridge had reorganized the brigade as the 3rd and 7th Kentucky, the 1st Kentucky, and Morgan’s Cavalry, and Byrne’s Battery was reassigned for the duration of the war, leaving the Orphan Brigade with the 2nd, 4th, and 6th Infantry Regiments, the 5th now officially redesignated the 9th. There were also Graves’s and Cobb’s batteries and the newly arrived 41st Alabama Infantry. Hanson was soon elevated to command of the entire brigade. As autumn turned to winter, the restive Kentuckians caused their share of trouble, stealing and pilfering from farmers in Middle Tennessee, deserting, and generally misbehaving. A number were tried and dismissed from the service or served time in the guardhouse. Meanwhile, one deserter, Private Asa Lewis of the 6th Kentucky, was returned by bounty hunters and put on trial. Bragg decided to make an example of Lewis, and the prisoner was executed by firing squad on the day after Christmas. The resulting enmity between the Orphans and Bragg persisted throughout his command of the Army of Tennessee. In early December the Orphans participated in the rout and capture of more than 1,800 Union troops at Hartsville, Tennessee, 40 miles north of Murfreesboro on the Cumberland River. A much larger battle was looming. The Union Army of the Cumberland, commanded by Maj. Gen. William S. Rosecrans, was on the march from Nashville. Rosecrans intended to drive the Confederates out of Tennessee, and both sides formed plans of attack. 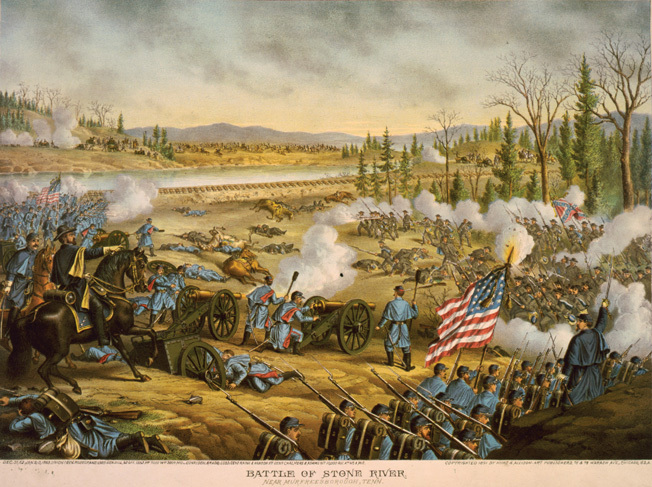 The ensuing Battle of Stones River, also known as the Battle of Murfreesboro, opened on December 31, and fighting raged west of the stream. The Orphan Brigade was situated near the town along a cluster of hills, and Cobb’s Battery fired throughout the day in support of attacking Confederates across the river. 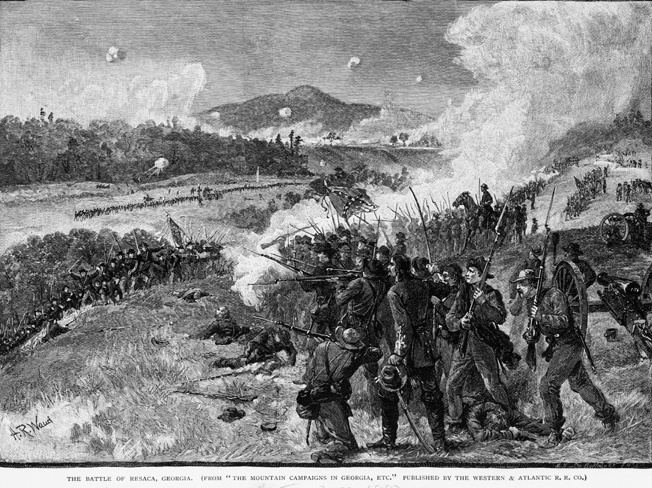 Hanson moved his troops several times to escape accurate counterbattery fire from Union guns. When Bragg struck first, two divisions made good progress against the Union right flank, and as the wintry daylight faded he was confident that he had won a significant victory. The expected Union withdrawal did not happen, and January 1, 1863, was spent with the two armies warily eyeing one another. The following morning, Rosecrans fully expected the Confederates to renew their attacks. He had strengthened his entire line and ordered Brig. Gen. Samuel Beatty to deploy his division across a ridge along the east bank of Stones River. From there, the Union troops could cover two primary fords that the enemy might use in its advance. Bragg was cheered for a moment with word that a Union wagon train was headed toward Nashville, 30 miles north. Rather than a full-scale retreat, it was simply the steady removal of the Federal wounded. Bragg frittered away the morning of January 2 then suddenly became aggressive again. The Orphan Brigade had suffered little during the earlier fighting, and Bragg intended to have the high ground where Rosecrans had ordered Beatty the day before. With the ridge in Confederate hands, Bragg’s artillery could rake the length of the Union battle line. Breckinridge had seen Beatty’s earlier movement and scouted the ground himself. A direct assault would be suicidal, he concluded. Not only was Beatty in a strong position, with two lines of infantry backed by the division artillery, but just west of the river the six guns of the 3rd Wisconsin Artillery were placed on a hill to fire at any enemy movement across the open ground. In the early afternoon Bragg met Breckinridge under a large sycamore tree near the river. He informed Breckinridge of his plan and ordered the Orphans to prepare for an assault that would jump off at 4 pm. Breckinridge was dumbfounded. He protested the order without success. When Hanson was told of the order, he had to be restrained from riding to Bragg’s headquarters and personally shooting the commanding general. Reluctantly, Breckinridge obeyed and set about deploying his division. The divisional artillery was placed between two lines of infantry. The Orphan Brigade stood to the left in the front line, while a brigade under General Pillow was on the right. Two hundred yards behind, two more infantry brigades followed. The Confederate tide rolled forward across open ground, around a large pond, and through knee-high scrub brush. Federal artillery began to blast gaping holes in the ranks. Observers were impressed by the discipline in the advancing ranks. Hanson led his men to within 150 yards of Beatty’s line, and there the Orphans made first contact with the enemy, absorbing a volley from three Union regiments partially sheltered behind a rail fence. Among these Federals were the men of the 8th Kentucky Infantry. 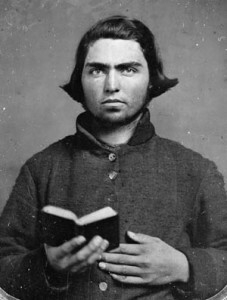 At the Battle of McPhersonville, near Camden, South Carolina, in April 1865, John Miller of the 2nd Kentucky became the last Orphan to fall in combat. The Orphans and Pillow’s men, mostly Tennesseans, returned fire and then charged to the crest of the hill with bayonets fixed. Hand-to-hand fighting ensued, and the hard-pressed defenders began to fall back. One Confederate remembered, “Our intrepidity demoralized the enemy, and they began to flee like blackbirds.” Hanson’s 6th Kentucky routed the Union 19th Ohio and forced a reserve brigade to retire, but along the crest of the ridge the Confederates were now exposed, and Union artillery opened with telling effect. A spherical case shot detonated among the Orphans, spraying lead balls in every direction while the spent fuse careened into Hanson’s left knee, severing a major artery. Carried from the field, he died two days later. Union forces reorganized and counterattacked the confused, often leaderless Confederates, driving them steadily back. Trabue tried desperately to stop the reversal, attempting to hold the dearly won hill. In the chaos of the retreat, at least seven color bearers of the 2nd, 4th, and 6th Kentucky were shot down, and Breckinridge’s shattered brigade only reached safety when its remnants returned to their original positions. In despair, Breckinridge rode among the survivors of the ill-fated charge and loudly lamented, “My poor Orphans! My poor Orphans! My poor Orphan Brigade! They have cut it to pieces!” For the Kentuckians, the butcher’s bill was indeed steep at Stones River. More than 430 were dead or wounded, a casualty rate of approximately 25 percent. The 2nd Kentucky lost 108 of 422 soldiers, and 13 of the 23 officers of the 4th Kentucky were killed or wounded. Six weeks after the defeat at Stones River, General Helm, recovered from a serious wound at Baton Rouge, took command of the 1st Kentucky Brigade in Middle Tennessee. Meanwhile, Rosecrans maneuvered Bragg out of Tennessee and captured Chattanooga, an important railhead, without firing a shot. By that time, Breckinridge and the Orphan Brigade were back under Bragg’s command, and the Confederates prepared for battle along the banks of Chickamauga Creek, just across the Georgia line from Chattanooga. Fought on September 19-20, 1863, Chickamauga was the largest battle of the Civil War in the West. The Orphans were engaged on a limited basis on the first day of the battle, losing 14 men to Union artillery fire. That afternoon Breckinridge was ordered to march six miles northward to the extreme right of Bragg’s line. The next morning, he ordered his three brigades to attack the Union left flank. At approximately 9:30, Helm received the order to attack with his 2nd and 9th Kentucky, while the 41st Alabama and 4th and 6th Kentucky Regiments deployed left to right. Moving forward with the 2nd Kentucky during the first attempt to carry the breastworks, Helm was struck in the side by a bullet fired from the ranks of the Union 15th Kentucky Infantry Regiment. He died a short time later at the age of 32. When President and Mrs. Lincoln learned of Helm’s death, the president reportedly wept and remarked to a member of his staff that he felt like King David when told of the death of his son Absalom. The Lincolns kept their mourning private to avoid condemnation over their sorrow at the death of a Rebel general. Emilie visited the White House briefly, then was given a pass to return to her home in Lexington. She never accepted Lincoln’s offer to rejoin the Union by publicly swearing an oath of allegiance to the United States. In all, the 2nd Kentucky lost 146 of its 282 soldiers at Chickamauga, while the 9th Kentucky suffered 102 killed, wounded, and missing from a morning muster of 230. These two regiments had repeatedly assaulted Thomas’s formidable breastworks and sustained more than half the brigade’s casualties. The regiments that attacked the Union flank lost 58 men. Roughly one third of the Orphans engaged at Chickamauga were killed or wounded. Although his battered army did not possess sufficient strength to hold such a vast ring around the city, Bragg chose to besiege Chattanooga. The Orphan Brigade moved first to Missionary Ridge, south of the city, then back to Tyner Station about seven miles from the Confederate lines. Two months of relative inactivity followed. Grant replaced Rosecrans in Chattanooga, and elements of three Union armies opened a trickle of supplies into the town and prepared to lift the siege. In three days of hard fighting, the Federals did just that. On the extreme eastern end of Missionary Ridge, the 9th Kentucky was called up to support Maj. Gen. Patrick Cleburne’s position at Tunnel Hill and repulsed a charge by Union troops under the command of Maj. Gen. William T. Sherman. The 1st Kentucky Brigade, now part of the division of Maj. Gen. William B. Bate, remained in reserve. Breckinridge, now commanding a corps, was nearly killed, and his son, Cabell, was captured. Bragg retreated to Dalton, Georgia, with the Orphan Brigade covering the withdrawal as it had so often done. The Orphans wintered in Dalton. Breckinridge was ordered to take command of the Department of Southwest Virginia and left in February. General Joseph Johnston had replaced the hated Bragg in command of the Army of Tennessee, and early on May 12, the Confederates were again on the move. The combined Union army, outnumbering them by one third, had begun its inexorable march toward Atlanta under the command of Sherman. For the next 100 days during the summer of 1864, Johnston proved skillful at defensive warfare, although he was repeatedly outflanked by the Federals. On May 14 at the village of Resaca, 60 miles north of Atlanta, Johnston stood and fought. The Orphans defended an angular position in the Confederate line, and the 5th, 6th, and 9th Regiments were only lightly engaged to the west. The 2nd and 4th withstood several heavy assaults and took serious casualties. Union artillery took a fearful toll. Two men lost arms to shell fragments. As night fell, Lieutenant Thomas McLean of the 9th lost a leg to a shell, and as he was being placed on a litter, a second shell cut him in half and killed two attendants. 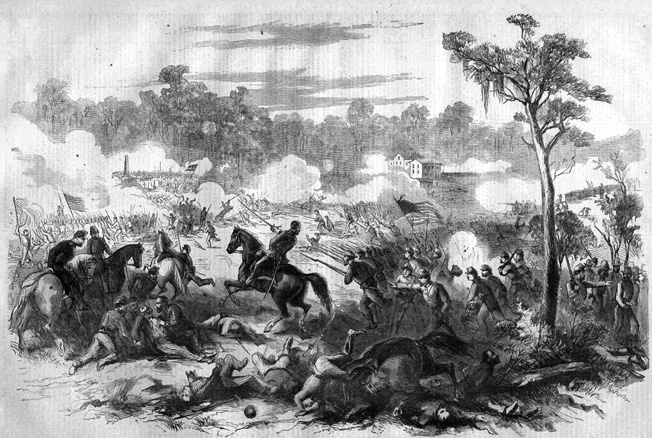 At the Battle of Resaca, Georgia, on May 14, 1864, the brigade suffered severe losses from Union artillery. Lieutenant Thomas McLean was among those killed. Johnston retreated ever southward. On the morning of May 28, the Kentuckians received new uniforms—the first fresh clothing they had seen in months. That afternoon, Johnston ordered them to move against the Union right near Dallas, Georgia, reasoning that Sherman’s multiple troop movements must have weakened that portion of his line. Mistaking gunfire to his left as the signal to advance, Bate sent the 1st Kentucky Brigade forward about 4 pm with a brigade of Florida troops on its left. Bate expected the Union entrenchments to be only lightly defended or even abandoned, but elements of the Federal XV Corps were there in strength. The Union fire was so intense that Private James Cleveland of the 5th Kentucky, whose regiment closed to within 20 yards of the Union positions, was shot five times before crawling back to his lines after dark. He died a week later. Captain David McKendree, believed mortally wounded at Stones River, recovered and rejoined the Orphans, only to fall victim to a bullet through the neck that severed his spinal column. Nearly 200 Orphans were killed or wounded in fighting that lasted scarcely an hour. Finally, the Kentuckians responded to the order to retire. The 5th Infantry flatly refused to comply until its commander, Lt. Col. Hiram Hawkins, grabbed the regimental colors and personally waved them back. Johnston retired to Kennesaw Mountain, protecting the Western & Atlantic rail line that supplied his army, and erected strong log and earthen fortifications. On June 27, Sherman lost 3,000 men in frontal assaults against the Confederates, while the Orphan Brigade was spared the brunt of the fighting. Within the week, Sherman was back to his flanking maneuvers, compelling Johnston to retreat to Smyrna on the north bank of the Chattahoochee River. Outflanked yet again, Johnston moved eastward to Peachtree Creek, just five miles north of Atlanta. Although Johnston had traded land for time and blood, the effort cost him his command. In mid-July, he was replaced by General John Bell Hood, a Kentuckian who had an arm mangled at Gettysburg and lost a leg at Chickamauga. Hood had a well-desrved reputation as a fighter. He pulled his army inside the defenses of Atlanta and ordered Bate’s division west to attack the Union left flank. The Orphans attacked on July 22. From the beginning, the assault was mishandled. Supporting units failed to appear, difficult terrain impeded progress, and a number of Orphans were shot down in the mud of a large mill pond. Behind heavy fortifications, the Union troops poured a murderous fire into the attackers. The Kentuckians managed to capture a portion of the Union line but could not hold. Unsupported, they withdrew. The senseless assault cost the Orphan Brigade 135 killed and wounded. Only 809 soldiers remained fit to fight. By late August, the endgame played out in Atlanta. Sherman again tried to sever the Confederate supply lines, which he believed would force them to evacuate the city. In an attempt to hold the rail line to Macon open, the Orphan Brigade mounted a late afternoon attack on well-entrenched Union positions west of Jonesboro on August 31. The charge was thrown back, leaving a number of men dead in a 10-foot-wide gully or waiting for darkness to make their way out of the pit and back to their own lines. 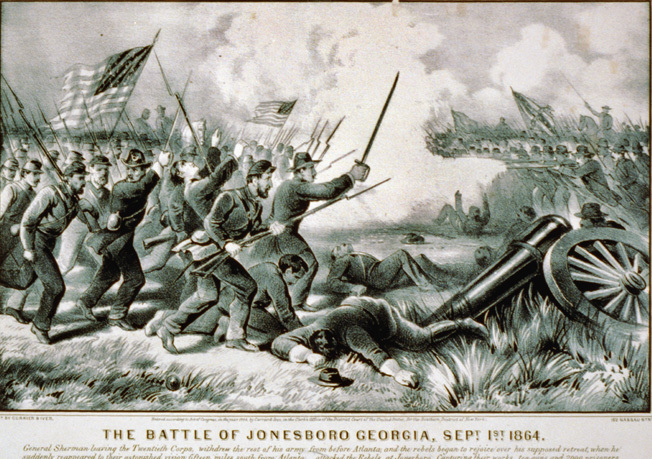 The following day the Federals assaulted the Confederate positions at Jonesboro, and furious fighting broke out. The dead and wounded Orphans at Jonesboro numbered 320. The brigade had been shattered, suffering nearly 1,000 casualties since the beginning of the campaign in May. Barely 500 men were still able to carry a rifle, and the battered 2nd Kentucky could muster only 69 soldiers. Hood abandoned Atlanta on September 1, while the remnants of the Orphan Brigade bought him precious time with their blood. Sherman began his famous March to the Sea on November 15, and the Orphans skirmished, briefly defended the city of Savannah which fell in late December, and held on until the spring of 1865. On April 18, nine days after General Robert E. Lee had surrendered his Army of Northern Virginia to Grant at Appomattox, John Miller of the 2nd Kentucky became the last member of the Orphan Brigade killed in action, shot during a brief clash near Camden, South Carolina. On April 17, Johnston surrendered his tattered Confederate army at Durham Station, North Carolina. Breckinridge, now serving as the last Confederate Secretary of War, briefly rejoined his old command at Washington, Georgia. There, on May 7, the 1st Kentucky Brigade surrendered. Originally, they had numbered more than 4,000. Barely 600 were paroled. In the coming days, the survivors of the Orphan Brigade made their way home. Some eventually rose to prominence and prosperity. Others wrote of their experiences and returned frequently to old battlefields to mark the places where their comrades were buried. Still others struggled to get by or died prematurely from the lingering effects of wounds suffered in battle. Truly, the Orphan Brigade had given life and youth to the Lost Cause, while winning deathless fame as one of the finest fighting units in the Confederate Army. Tags 1st Kentucky Brigade, Abraham Lincoln, albert sidney johnston, Army of the Cumberland, Battle of Stones River, Beriah Magoffin, Chattanooga, Chickamauga, Confederacy, Confederate Army, Confederate Army of Tennessee, Earl van Dorn, Fort Donelson, Fort Sumter, general john bell hood, General John C. Breckinridge, general joseph e johnston, general pierre gustave toutant beauregard, Gideon Pillow, ironclad, James Buchanan, Jefferson Davis, John Brown, John Hunt Morgan, Leonidas polk, Missionary Ridge, Nashville, nathan bedford forrest, Orphan Brigade, patrick cleburne, Port Hudson, Simon Bolivar Buckner, Stones River, Ulysses S. Grant, Union Army, Vicksburg.